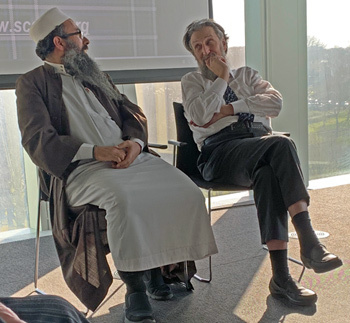 SCoJeC Director Ephraim Borowski joined Imam Ibrahim to deliver the Hay of Seaton lecture in Aberdeen University on the topic of "Jewish and Muslim Lives in Scotland". The event took place in the aftermath of the terrorist attack on two mosques in New Zealand, and Ephraim began by expressing the sympathy and condolences of the Jewish Community with all those affected. He said that once again events showed that hatred knows no boundaries – attacks on Muslims are not only a problem for Muslims but for all of society, as every terrorist atrocity, whether against a synagogue in Pittsburgh or a mosque in New Zealand, serves to normalise such evil. However, antisemitism fortunately does not define Jewish life in Scotland. Ephraim spoke about the diversity of the Jewish Community of Scotland in terms of demography, geography, and affiliation, and explained why the census gives at best a very approximate picture of the Community. In Scotland the question is about "belonging" and many Jewish people have nothing to belong to, or do not see their Jewishness in religious terms, so he welcomed moves to enable people to identify as culturally, historically, or ethnically Jewish. The first formal Scottish community was established in Edinburgh just over 200 years ago, and there had been very few Jews in Scotland before the 18th century. A major research project that had just concluded sought to map the arrival and settlement or re-emigration of every Jewish person who had ever lived in Scotland, and this had shown the pattern of immigration, first from Eastern Europe and then refugees and survivors of the Nazis. SCoJeC's two studies of the experience of Being Jewish in Scotland in 2012 and What's Changed about Being Jewish in Scotland in 2015 had been funded by the Scottish Government in response to some very distressing examples of antisemitism, but the research had also asked participants what they found good about being Jewish in Scotland. In 2012, the findings were largely positive, with one Aberdonian respondent saying that "Scotland's a darn good place to be a Jew". By 2014-15 that picture had changed, with significant numbers reporting that they felt alienated and vulnerable and a small number talking about leaving. However, there are many other factors that are influencing the future of the Community, and Ephraim commended the Scottish Government, local government, and other public authorities for being more sensitive to the needs of minority communities. Imam Ibrahim, who is the Imam of the Spital Mosque in Aberdeen, and Muslim Chaplain to the University, began his talk by chanting a passage of the Koran that emphasises the shared humanity of all people. 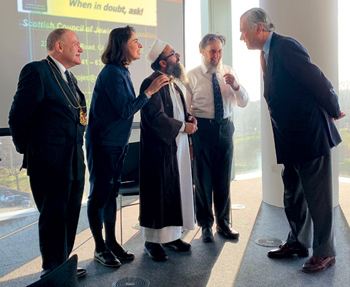 He said that the Muslim Community in Scotland is mainly located in the cities, and is engaged in outreach and interfaith activities in order to foster positive attitudes to religion in wider society. He is personally committed to such activities, through regular open days in his own mosque, and he also organises a stall in the city centre to promote better understanding of his faith. The event was chaired by Dr Alessandra Cecolin, Lecturer in the Religions and History of the Middle East at the School of Divinity, History and Philosophy, and it was attended by the Lord Provost of Aberdeen, Barney Crockett, and by Angus Hay, the nephew of Alice and Malcolm Hay in whose memory the lecture is named.